The phrase “dress for success” brings to mind power suits, not rock & roll panache. But imagine Elvis without blue suede shoes, Prince without a leotard or Freddie Mercury without a mustache. For Salt Lake City-based sextet L’anarchiste, however, dressing for success means less flair and more professionalism: for instance, button-down collared shirts for their City Weekly Music Award performance at The State Room on April 27. The shift in style helped captivate the audience as they listened to the band’s brand of epic folktronica. “We dressed sharper than normal because we wanted to feel more professional, to have a more sophisticated image,” says bassist Alex Gilvarry. An air of sophistication matches the aesthetic of L’anarchiste’s unique symphonic soundscapes, which draw upon a diverse assortment of instruments—from banjo to bass synths, from violin to kazoo, from trombone to hand claps. Any given song can go from quiet and thoughtful phrasings to a gigantic high tide of notes and emotion. This washing in and out makes sense when songwriter Rob LeCheminant talks about how he writes. “I visualize the motion of the music,” he says. “I love seeing the motion, and I try to capture that.” The “motion” is propelled by emotion—the core of LeCheminant’s songs. L’anarchiste began as a basement-recording solo project of LeCheminant’s in 2011. The singer and multi-instrumentalist was once a university student in jazz composition with goals of penning symphonies, not indie-folk tunes. Things changed, but that deliberate, composed approach to writing remains. “I’m more prone to being indulgent with songs now. Ones that are bigger, but can also get quieter, and with really interesting textures,” LeCheminant says. A Sufjan Stevens concert in 2010 facilitated this ethos. “I realized I could write whatever I wanted to, because he had absolutely no fear of what people thought,” LeCheminant says. LeCheminant recorded five songs for a self-titled EP, which was released Dec. 20, 2011. The album was a balance of concerted minimalism and took cues from various sources like Phillip Glass, Sufjan Stevens, Arcade Fire and Local Natives. Some songs are articulated over a seven-minute span—“Stony” and “Iron”—something not many bands would dare to do. Even with epically long, huge-sounding songs, L’anarchiste never loosens its grip on the listener as the working parts ebb and flow. LeCheminant grew tired of the solo shtick, and L’anarchiste became a band around the time of the release, with its first show in February 2012. Soon after L’anarchiste’s first show, the band was featured on ChooseMyMusic.org and played a gig sponsored by the U.K.-based blog at South By Southwest. Choose My Music launched a record label in 2012, and L’anarchiste was one of two bands initially signed. In 2012, L’anarchiste was also featured on KUER’s RadioWest. L’anarchiste will soon launch a Kickstarter campaign to fund its first full-length album, to be recorded at June Audio in Provo with producer Nate Pyfer (The Moth & the Flame, Polytype, Mideau). The album is scheduled for a September release. Giant, as the album is tentatively called, will certainly live up to its maximalistic name. For instance, one song, “For a Moment I Opened My Eyes,” is more than 10 minutes long and is composed of 79 tracks—layered percussion, reversed sounds, glockenspiel, synth pads, etc. The album owes something to classical music, the themes and variations of one recurring melody popping up in most songs. Each track stands alone, yet “talks” to the others. The instrumentation is robust, and there’s a mojo in the production that will warrant repeated exploration. L’anarchiste’s Giant is fresh in its charm and attention to detail, and exciting in its depth and complexity. It’s something that we can feel. 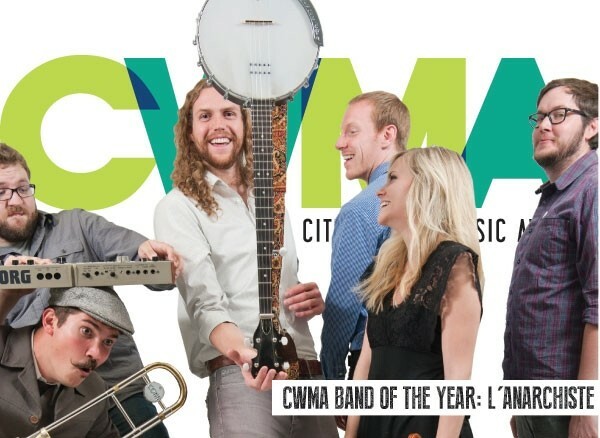 L’anarchiste: Grant Miller (trombone, trumpet, melodica), Erich Newey (keys, vox), Rob LeCheminant (vox, banjo, guitar, trumpet, percussion), Alex Gilvarry (bass, keys, vox), Morgan Broadway (violin, keys, vox) and Jacob Hall (drums, synths).